← We’re up and live…2017 Occasions Catalog and Sale-A-Bration time! Now that the craziness of the holidays are behind me, I finally got back into my craft room this past weekend and had fun creating. I wanted to break open my “By the Shore” DSP, since I haven’t used it yet, to create a few cards. I’m down to the wire to get my last minute card in for this week’s FMS#269. I saw the sketch earlier last week and had all kinds of ideas, and here’s my final creation. It was a fun and simple card to make! I did a horizontal version of by just flipping the template to make my By the shore – best fishes birthday card. I cut a 5-1/4 x 4″ piece of the DSP for the background for “waves”. Now that I look at it, maybe I should have flipped it the other way and put the “waves” on the bottom and the fish on the top? Oh well, it’s done. The other side of the “waves” is the fish which is cut 5-1/4″ x 1″. The “Best Fishes” tag is 1/2″ and the other one is cut at 3/4″. I used the Banner tag punch for the ends of both tags (trying to make them look like nautical flags). I fed the tags over outside and into the punch so I could leave them longer than the punch usually cuts. I tied the Brown Sugar thick twine around several times and added a enamel star for accent. Thanks for stopping by and hope you’ll come back again! Follow me so you don’t miss my posts! This entry was posted in Annual Catalog, Best Wishes, Birthday cards, Celebrations, FMS templates, Stampin' Up! 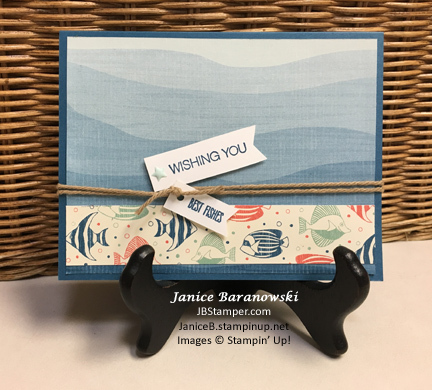 and tagged By The Sea, FMS challenges, Stampin' Up!. Bookmark the permalink. Such a pretty ocean scene! The sketch works perfectly flipped! Glad y joined us at FMS! Great idea to flip the sketch! You’ve used it in a wonderful way to make a fabulous nautical card! Thanks so much for joining us at Freshly Made Sketches. I love the sketch flipped! It makes for a very fun ocean with those bright colorful fish. Thank you for joining us at Freshly Made Sketches. Thanks Rita! I always enjoy participating in FMS challenges! They gives me great inspiration for my cards…hoping I have more time now that I’m semi-retired to participate more!